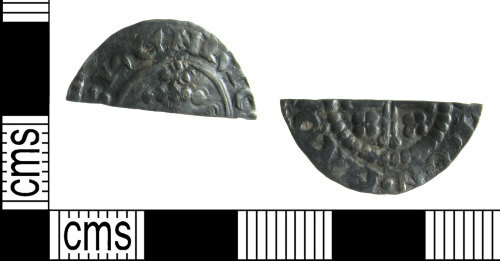 A silver medieval cut half penny of Henry II (AD 1154-1189) dating to 1180-c.1189, type 1b. Mint of Lincoln, possibly minted by Rodbert. North 1991 volume I, page 220, number 963. Medieval coin: cut halfpenny of Henry II (1154-1189) minted by either Gilebert, or Rodbert between 1180 and c. 1189 AD. North No. 963-964.